Total Dictation, an educational event to ensure familiarity and good Russian language writing skills, was recently held in India, for the first time, with participation from Delhi University. Total Dictation (TD), an educational event organised annually in Russia and countries across the world, was held in New Delhi for the first time, with the participation of Delhi University. 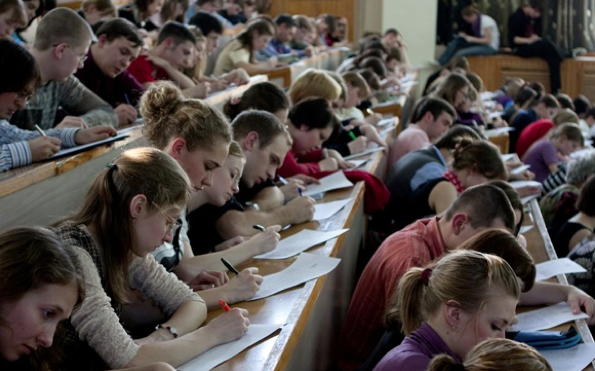 In the TD event, participants take dictation from a Russian text which is read out, after which they write it through and get marked for their skill in writing without mistakes. The organizers of TD in India want to expand the number of places where the event will be held in 2016, and to attract new participants, including people from other universities, RIR learned from Anna Voytsekhovich, one of the organizers of the dictation. “We hope this initiative will gain popularity in India, and we will expand the number of sites,” she said. Total Dictation is an annual educational event designed to draw attention to issues of literacy and develop a culture of literate writing. It is essentially voluntary free dictation to test the Russian language writing skills of those who wish to participate, and is run simultaneously in hundreds of cities in Russia and around the world – with times adjusted for local time zones. “Writing literately is very fashionable!” say the creators, who call this activity a ‘flash mob.’ People unfamiliar with each other learn about the event on the Internet and go to a specific place to do something unusual together, and then disperse. This year, the event was held in India for the first time. About 60 people from five countries; Russia, India, Belarus, Estonia, and Ukraine; participated in the event. “More than 80% of the participants were foreigners,” said Voytsekhovich. Girish Munjal, Russian language teacher at Delhi University, read the text. “We hope to take part in this dictation next year as well. We will be ready to host it, if the organizers ask the university administration to do so,” he said. The TD this year was written by nearly 94,000 people in 548 cities, in 58 countries. This is 33% more than in 2014. Based on this idea, a dictation text is specifically written by a modern Russian writer, recognised at home and abroad. The text is read out for students by well-known representatives of show business, culture, and the arts. The author of this year’s TD text is the author Yevgeny Vodolazkin, winner of the ‘Big Book’ and Yasnaya Polyana literary awards. The authors of TD in different years have been the writers Dina Rubina, Zakhar Prilepin, Alexey Ivanov, and Dmitry Bykov.